Any person acquiring a vehicle in South Dakota must title and register their vehicles within 45 days after the date of purchase before it can be operated on the state’s public highways. South Dakota law requires drivers to register their vehicles with the South Dakota Motor Vehicle Division. All motor vehicles, motorcycles, and trailers owned by South Dakota residents and operated on public highways must be registered with the County Treasurer of the owner’s residence. If you are moving in from another state, you have 90 days from your date of arrival to title and register your vehicle in South Dakota. Upon completion of the registration process, you will receive standard license plates which must be displayed on your vehicle. You can replace a damaged, lost or stolen license plate, just contact your local county treasurer’s office to complete an Affidavit For Duplicate License Plate/Validation Sticker. Lost or stolen license plates or validation stickers must be reported to a law enforcement agency. In South Dakota, if you wish to transfer the license plates from your old vehicle to your newly acquired vehicle, you can do this at your local county treasurer’s office. In applying for transfer, bring your old plates with you to the county treasurer’s office. Buying a used car in South Dakota? Don’t make a costly mistake. 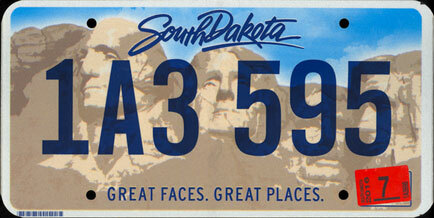 Run a Free License Plate Lookup for your South Dakota-registered vehicle! Run a Free South Dakota License Plate Lookup to uncover the full-story of your South Dakota-registered vehicle.